Your skin is the largest organ of your body and is subject to all different types of fungi, bacteria and even yeast infections such as athlete’s foot, ring worm, nail fungus, acne, jock itch, and even body and foot odor. Finding a good quality anti-fungal and anti-bacterial soap or body wash can help treat these various conditions and relieve the itching and other symptoms that are part and parcel of these conditions. So, here is a look at the best natural anti-fungal soap and body wash including user reviews. This Purely Northwest anti-fungal body wash is made in the USA and is formulated to treat all different types of fungal conditions as well as bacterial infections or conditions. It is enriched with essential oils including Tea Tree Oil and is paraben, petroleum, silicone and fragrance free. Users find that this anti-fungal soap works extremely well helping to heal foot and nail fungus as well as improve acne. They also review that it reduces or eliminates foot and body odor. In addition, they state they begin feeling and seeing improvement in their skin within a couple of days of use. Some people even say that this product works as a shampoo and leaves their skin softer. This Oleavine antifungal soap comes in a 12 ounce container. Some of its ingredients are 100% therapeutic grade tea tree oil, coconut oil, shea butter, vitamin E, wild crafted Neem oil, rosemary leaf extract, lavender oil and others. It is chemical, preservative as well as gluten free. Made from organic and natural ingredients, this product can be used both for the body and as a shampoo. It is specially formulated to treat bacterial and fungal skin conditions including athletes foot, ringworm, Jock itch and acne as well as nail fungus and body/foot odor. Users really like this wash and review that it leaves their skin feeling clean, fresh and soft. It also clears up their acne and really helps to relieve ringworm. This Therapeutic Foot & Body Wash comes in a 12 ounce bottle and is made from good quality natural ingredients such as tea tree oil, mint, aloe vera, rosemary, coconut, jojoba and olive oil. It is made in the USA and does not contain synthetic chemicals, preservatives, artificial colors, detergents and alcohol. Users find that this natural body wash is excellent at combating fungus as well as bacteria and it really helps with athletes foot. It stops itching for different conditions and even dry skin, and works well for nail fungus and yeast infections. Finally, it gives a sensation of freshness to the skin. This Anti-Fungal Tea Tree Oil Body Wash contains the maximum amount of pure tea tree oil allowed which is 5%. It is made of some great natural and organic ingredients, and is produced in the USA. It is hydrating to the skin and helps heal a number of skin conditions caused by bacteria and fungus. It can also be used as an Eczema body wash since it is free of chemicals, preservatives and synthetic detergents. Users really feel that this natural soap is hydrating and helps to heal all different types of skin irritations. In addition, it is really good at reducing foot and body odor and is soothing to the skin. Other benefits people experience is itchiness relief and the reductions of eczema flare ups leaving them with healthier skin. This Majestic Pure Anti-Fungal Tea Tree Oil Soap comes in a 16 ounce container and is chemical, paraben, and artificial color free. It contains 5% of Tea Tree Oil and is designed to treat fungus, bacteria and yeast. Some of the skin conditions you can use it for is athletes foot, body odor, acne, toenail fungus, jock itch and yeast. Users find that this product has a nice scent. It clears up fungal infections and improves athletes foot, leaving the skin feeling refreshed. Besides, it softens the skin and leaves it feeling clean. Users also use this foot and body wash to relieve itchy scalp, leaving it more scale free and healthy. This anti- fungal soap by Premium Nature is an all-natural body wash that comes in a 12 ounce container and some of its ingredients are Tea Tree oil, Aloe, Peppermint, Oregano, Eucalyptus and Rosemary. Apart from its antifungal properties, it has moisturizing properties as well. The company support their product with a 100% guarantee. Users state that this natural body and foot wash helps to kill ringworm and stop itchiness. It leaves skin feeling softer and really helps to clear up fungal infections. Overall, it is effective and has a slight cooling effect due to the peppermint oil. 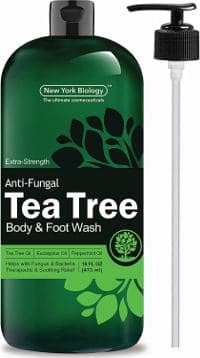 This large 33.8 ounce Calily Life Anti-Bacterial Body Wash combines organic tea tree oil with naturally antibacterial and antiseptic Dead Sea Minerals and other organic ingredients to combat fungus as well as bacteria and eliminate odor. This product is a powerful natural deodorizer that has a fresh scent and, according to the company, it can be daily used not only for the body but for the face as well. It is free of synthetic detergents, preservatives or other chemicals and is hypoallergenic and suitable for sensitive types of skin. Users like its scent and review that it removes skin impurities and neutralizes bacteria, leaving the skin clearer and healthier looking. It also fights fungal conditions and helps to relieve itching and acne. Finally, this large bottle lasts a long time. In addition, it is free of chemical ingredients and has a pH of 9.6. This gel is formulated to fight bacteria, viruses, fungus, ringworm, athletes foot, body and foot odor as well as acne. It also works to relieve itching skin and is good at fighting foot fungus. Users find that it keeps their private area fresh and works fast to help heal different skin conditions. Teens find that it really helps heal their acne faster and may even prevent future acne breakouts. This ArtNaturals Essential Body and Foot Wash comes in a 12 ounce bottle and contains such ingredients as Tea Tree Oil, Peppermint, Eucalyptus Oil, Aloe Vera, Jojoba Oil and Coconut oil. It is paraben free and, according to the company, it can be used by anyone who is more than three years old. Nevertheless, I would have my reservations using it for children since the use of various essential oils might be a bit strong for the sensitive skin of very young children. Also, even though it is generally said that the preservative phenoxyethanol is safe when used at low percentages, I would choose to exclude it from a baby´s bath. Still, with most of their products the ArtNaturals Company recommends that a patch test should be done in order for you to check if your skin is reactive to any of their products´ ingredients. They also offer a 100% money back guarantee. When it comes to users´ reviews, people say that this body wash helps to treat their acne or ringworm and prevent treats and rashes. Besides, it relieves dry itchy skin and leaves them feeling really clean and fresh. This Hose Off 2-in-1 Body Wash comes in a 12 ounce container and contains essential oils, plant extracts and botanicals including aloe vera, shea butter, nutmeg, rosemary and vetiver essential oil. It does not contain artificial fragrances and fillers, it is cruelty free and is made in small batches to ensure effectiveness. It is good for dry and sensitive skin and is formulated to treat fungal and bacterial conditions as well as hydrate and rejuvenate skin. It also comes with a 100% satisfaction guarantee. Users review that this soap really works well to clear up their acne and can also be used as shampoo. It is good at fighting body odors and leaves people feeling clean and fresh. Finally, it is great for sensitive skin. All in all, if you suffer from a bacterial or fungal infection and skin condition, then one of the best natural and organic anti-fungal soap and body wash in this review should definitely provide you with some good healing results.